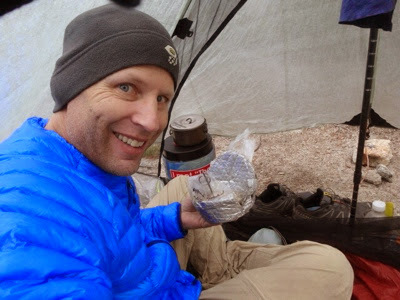 I have used a ZPacks Hexamid Solplex tent for two thru hikes. It is my favorite tent... ever! What do I want from a tent? A tent needs to be able to protect me from the elements. Cowboy camping may be great and if that's your thing, HYOH. 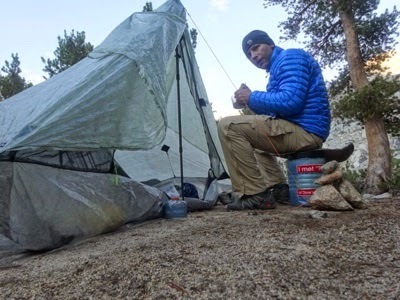 For me though a tent is my chance to escape from the elements that are up close and personal whenever I am outdoors. I am not a back to nature nut, nor do I make any attempt to use only 'natural' fibers. In my opinion, man is as much a part of nature as a silkworm. If man can invent and produce a fiber then it is a natural fiber, even if it is man made. Cuben fiber is a fiber that is almost supernatural. In my opinion it is worth the money to buy it if you can afford it. My old sil-nylon tent was great, but it always sags when the dew settles in it in the evening. It can stretch and be stretched. When I set up my Solplex it stays taut and doesn't sag. Cuben fiber doesn't stretch, is as waterproof as plastic, and is incredibly durable. I was skeptical that a fabric so light and fragile feeling could be so strong. I was sure that the wind was going to, at the very least, rip out the guy points. It did not. What about wind driven rain? Like what happened this year on the Friday at ADZPCTKO? I got back from the first twenty mile leg of my hike in time to see the clouds of the squall approaching the campground across the valley. I oriented my tent so the back was facing the wind. (I have since found that my tent would rather take on the wind at an oblique angle, not square to the wind). Other than having to reset the back stake that pulled free once, I did not get wet. Even with the rain driving against the back of the tent. The design lets the air circulate freely through the tent, but water does not get to defy gravity and follow the air. The integrated bathtub floor is high enough on all sides that you could be set up in a swamp and still be dry. The size is about thirty inches by one hundred inches which is enough room to fit all my stuff inside my tent. My only rule is that my shoes are never allowed inside, they stay right outside the door under the vestibule, where they stay dry, or at least don't get any wetter than they already are. With all my stuff inside I always know where, in a general sense, my stuff is... In my tent. The tent came with a loop up in the top corner by the tall pole. What it needed was another loop on the other side by the short pole. I set that request to Joe at Zpacks and he sent me a stick-on cuben fiber reinforced loop and said that from now on all to new Solplex's will come with the loop. What's so great about the loop? I have attached a line between the loops which gives me an indoor clothes line. Wash your socks and hang them above you and they'll be mostly dry by morning. One of my favorite features of this tent is the side entry door. I can set up the tent with a left handed door or a right handed door. I get in on the side not the end. I can sit in the middle of the tent and it is high enough that my head is not bumping the top. Everything is I reach from the center of the tent. The tent doesn't need a ground cloth or footprint. But I like one to keep the bottom of the tent from getting dirty or muddy. I use a length of polyoleofin plastic, the kind that Lowes sells for insulating your sliding glass doors. This is a heatshrink product that I use as a ground cloth. The weight of a thirty inch by one hundred inch piece of this material is only one ounce. I have used the same piece on two thru hikes camping for more than thirty days on the same piece on rocks, mud, sand, loam, whatever and it is still working. A piece of Tyvek of the same dimensions would weigh in at six ounces. Extra guylines to hold it down. I was surprised the tent didn't rip! I have a shelter solution that I feel confident will protect me from the element that only weighs about one pound. 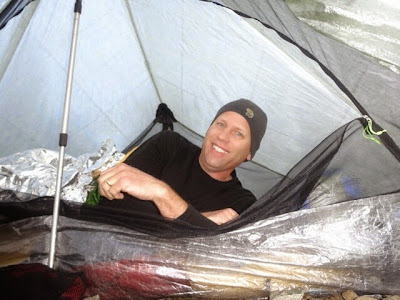 My bivy sack and tarp was slightly lighter but I didn't have the luxurious room that a tent affords, especially when you want to escape the rain or the mosquitoes. I'd rather eat in my tent than in the rain. Try this in a bivy sack. How tall are you? I am 6'3" and considering Zpacks tent options. Could the Solplex accommodate my height? I am 5'11" tall. I believe the Solplex is 90" long so you'd have 1'3" or so. I think I would still use the Solplex if I was your height. 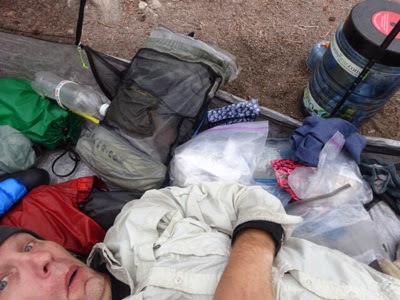 The main thing to consider is the distance between your face and the tent above you. Great review, thanks! I can't decide between the Solomid and the Duomid and I am looking for some advice. 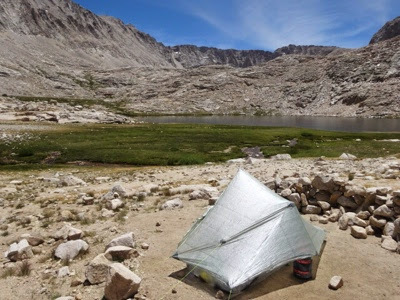 As I always hike on my own or with other (solo) hikers with theit own tents, a one person tent would be enough for me. But I don't want the tent to be too tight for me and my gear either. (I am 1,82m tall and i am a side sleeper.) As the Duomid is not much heavier, I was about to buy it. But I just don't like the shape of it. The pictures of you in the solomid show you next to all your stuff. That looks quite tight. Are there more pictures? How do you arrange your stuff inside? DO you mean Z Packs Solplex and Duplex? Or MLD's SoloMid and DuoMid? I'm 185cm tall and find the DuoMid tight length wise (the wall hangs over too close to my face). Thanx for your answer... and sorry, I got confused. I meant the Zpacks Solplex and Duplex. I am still in the process of deciding between these both. The questions above are still current... What's your oppinion? Can't seem to find the polyolefin insulation you mention for your footprint anywhere. Can you give me more details? Thanks for the great video.